Year after year, Nancy Silverton returns to the same medieval Italian village to relax, cook and find inspiration from rustic dishes perfected by generations of women. 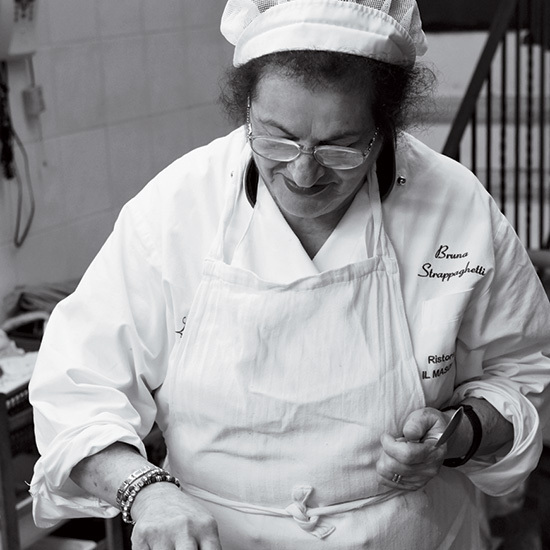 Year after year, the famed Los Angeles chef returns to the same medieval Italian village to relax, cook and find inspiration in the crisp chicken, rustic pastas and other satisfying dishes perfected by generations of women. Silverton is also inspired by all the women she finds in restaurant kitchens throughout Italy, especially in small towns. In fact, her local spot, Ristorante Masolino, is run by three women: Bruna Belfico, her daughter Stefania, and her daughter-in-law Sonia. “In Umbria, the food is simple and all the menus are the same,” says Silverton. “But not everyone cooks well. At Masolino, the food is just right. The place captures the spirit of Italy so beautifully.” The Belfico women don’t usually let visitors into the kitchen, nor do they share recipes, but Silverton was allowed in when her friend Phil Rosenthal came to film his upcoming PBS show, I’ll Have What Phil’s Having. In the Masolino kitchen, Silverton discovered the secret to one of her favorite dishes, chickpea bruschetta: a very generous amount of olive oil. “My Italian is terrible, but I know olio and rosmarino, both of which are a big part of the recipe,” she says. Nominate the women who inspire you @foodandwine using #FOODWINEWOMEN.